Steven and Xanthe Lawrence. 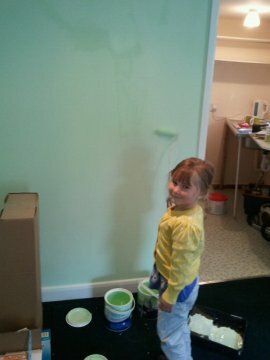 Even little Emma was hard at work with the paintbrush in the lead up to the opening date! After succesfully graduating from Glamorgan University in 2002 with a BSc (Hons) in Chiropractic, Xanthe and Steve started work at Nantwich Chiropractic Clinic. Shortly after, they were looking to expand and found an excellent location within The Castle Country Club leisure centre just outside of Shrewsbury. After 8 years of working between the Nantwich and Shrewsbury clinics, Xanthe and Steve decided to establish a clinic closer to home to reduce the time spent travelling. After months of preparation on the 11th July the clinic opened its doors to the first patient. If you would like to make an appointment, please call on 01785 748677 or call into the clinic where our friendly staff will look after you.